This is to introduce a new term into translation studies aka translatology. It's translational licence (TL). Beware! It has nothing to do with licence in the sense of an official document, nor for that matter with translational in its medical sense. It's licence as used in the literary term poetic licence. That is to say, "the act by a writer or poet of changing facts or rules to make a story or poem more interesting or effective.."
In this case, for "writer or poet" substitute translator; for "facts" substitute the original text; and for "rules" substitute the current norm that a translator should stick as closely as possible to the content and manner of that text. Notice that it does not cover mistakes. TL is something that the translator takes advantage of knowingly and intentionally. It can best be explained by an example. The following is a famous one. Edward Fitzgerald's nineteenth-century translation of the Rubai'iyat (quatrains) by the eleventh-century Persian astronomer-poet Omar Khayyam is one of the best loved poems in the English language. As much loved in English as it is in Persian. Yet nobody should be under the illusion that it's an accurate translation. Certainly Fitzgerald, who learnt Persian for the purpose, never claimed it. On the contrary, he said in a letter to a friend that he had "transmogrified" it. (Transmogrify means "transform in a surprising or magical manner.") He was not above inserting verses that were entirely his own invention. So he knew what he was doing and he assumed the concept that is expressed by translational licence. A classmate and friend of mine when I was a student at the School of Oriental and African Studies in London was Peter Avery. Peter was studying Persian, but we were brought together because students of Persian also had to learn some Arabic.He was later to become Lecturer in Persian at King's College, Cambridge and died in 2008. Though he didn't deny the poetic value of the Fitzgerald version, it irked him that English readers never got from it the true feeling of the Persian, because it was veiled by Victorian sentiment and versification. So he did his own more accurate translation and got together with a poet, John Heath-Stubbs, to polish it. "It seemed important to try and convey the baldness of the originals. Past translations of Persian verse have often tended to blur and soften the hard directness of the Persian, allowing a sentimentality quite absent from the original to intrude. It is hoped that these translations will answer the question a Persianist is often asked: 'What do the Persian originals of the ruba'is really say? On the other hand, there is no need to disparage the famous version of Edward Fitzgerald. His work is more in the nature of a fantasia than a translation. It is often very free and occasionally not precisely accurate. 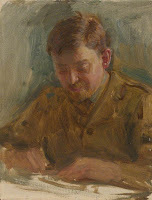 Fitzgerald's poetic intuition guided him aright in divining the essentially sceptical and unorthodox nature of the Persian poet's thought, but he was also the champion of such Augustan poets as Dryden and Crabbe… His study of them gave to his work on Persian originals a concision and wit which were entirely appropriate." Here's a small sample of what this is all about. First a quatrain in the Avery-Heath Stubbs translation and then in Fitzgerald's. Will have more wealth than a Sultan's realm. O wilderness were paradise enow. For a time we were beguiled by our own mastery. In conclusion, say what we will as academic linguists, Fitzgerald retains his popularity thanks to translational licence and clever poetry, whereas the Avery-Heath Stubbs translation has been remaindered. There's a clue to Fitzgerald's success in another term that was discussed on this blog fairly recently, namely translator's affinity (to retrieve the post, enter affinity in the Search This Blog box on the right). It's defined there as "empathy with the original author." Though Omar and Fitzgerald were far apart in time and place, they were kindred spirits. The Cambridge English Dictionary, for the term poetic licence. Omar Khayyam. The Ruba'iyat of Omar Khayyam. Translated by Peter Avery and John Heath-Stubbs with a long Introduction by Peter Avery. London: Allen Lane, 1979. Penguin Classics paperback edition 1981. 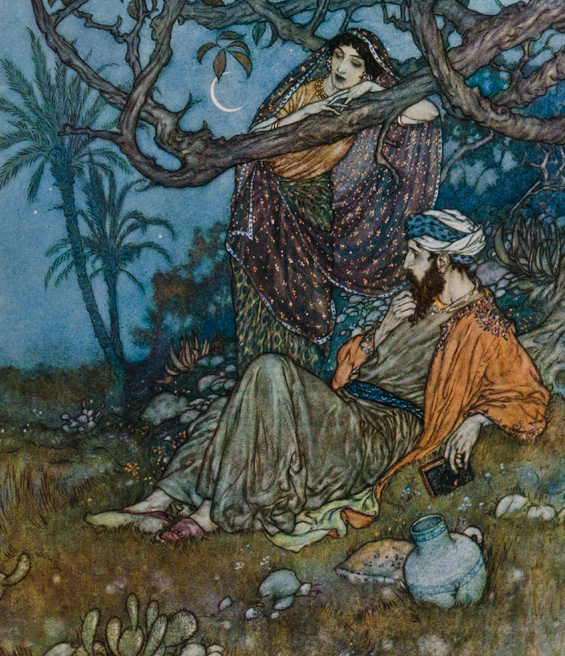 Omar Khayyam by the great illustrator Edmund Dulac, 1909. Source: David Brass Rare Books. Today. the Ninth of October (el Nou d'Octubre), is the national day of the Valencians, a holiday throughout the Valencian Community, which consists of the Spanish provinces of Valencia, Alicante and Castellón. It commemorates the bloodless entry by the Christian monarch James I into the Moorish city of Balansiyya in 1238. 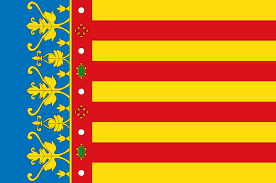 James was king of Aragon; that's why the flag of Valencia, the Senyera (shown above) is based on the heraldic arms of Aragon. In previous years, this blog has celebrated the day with a historical post about it. This year here's something different: a brief introduction to the Valencian language. It takes the form of the lyrics to the Valencian national anthem. There's a truly rousing performance of it on YouTube, sung by the popular Valencian singer Francisco; and with it the lyrics in Valencian and Spanish. To see it and listen to it, click [HERE] or go to https://www.youtube.com/watch?v=esDfiT4H_XM. It's accompanied by a typical Valencian band (banda); there's one in every town and village of any size, often with a music school. There are Wikipedia articles on Senyera and James I of Aragon.